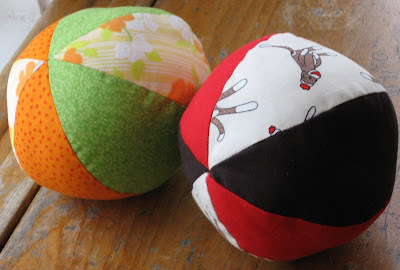 I made these soft balls for the kids for Easter using a pattern from Grand Revival. They were quick to make and I used fabric I had on hand. I'm not great at stitching up round things like balls and stuffed animals, but these turned out alright-just a little tumorous. Actually, my mom stuffed them and stitched them closed for me while she was visiting. No wonder it seemed like such a quick project! I was excited to give a handmade gift to the kids (today, since we didn't get to it yesterday), but my daughter wasn't so thrilled. She was clearly expecting something else, because her excitement vanished as soon as she pulled out the ball. She threw it down, claiming she didn't like it and didn't want it. Not exactly what I was expecting. So we gave away her ball to one of our friends at playgroup today. It's not really the kind of giving I want her to become accustomed to ("It's not good enough for me so I'll give it to someone else" or giving as a punishment), but today, that's all my mind came up with. I was sorry to see it go, but oh well. At least my son likes his. I don't like sewing round objects. I think they ended up very pretty & don't look so tumorous in the photo! I hear ya. I am making these Bunny Bowling Pins, and I HATE stuffing and sewing them shut. I've seen the balls online and have avoided making them at all costs.